Close Time: Closed 25th December, 1st of January and 1st of May. 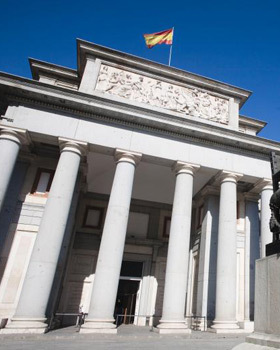 Visit El Prado Museum, the most important art gallery in the world. Admire the works by Goya, Velázquez, Rubens and Caravaggio amongst others. The visit will take place in chronological order, starting with the exhibit hall where the masterpieces of J. Bosch (El Bosco) (1450-1516): The Table of the 7 Deadly Sins, The Hay Wain, The temptations of San Antonio, The Stone of Madness and The Garden of Delights. Continue on to the rooms devoted to the Greco (1540-1614): The gentleman's hand on his chest, The Trinity, Christ embraced the cross and The Annunciation, Velázquez (1599-1660): The Worship, Drunkards, Equestrian Portraits, the Forge of Vulcan, The Christ, The spinners, Spears and Las Meninas, ending with Goya (1746-1828): The family of Carlos IV Pictures, The Shootings of May 2, Pestles and Black Paintings.